Novlum is a software company that develops geospatial software products focusing on real-time processing, visualization and efficient analysis of 3D geographic data. Novlum’s goal is to develop software products that are powerful yet easy to use, enabling non-GIS experts to leverage the power of GIS. 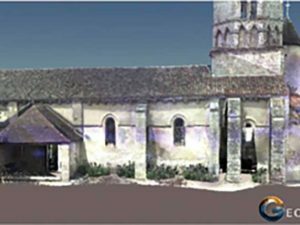 Novlum has extensive experience in Digital Elevation Model processing. Novlum’s Digital Terrain Model (DTM) generation system is a differentiator in DTM production. It facilitates fast and low-cost DTM creation from any existing 30-meter posted Digital Surface Models (DSMs) and, in the near future, high-resolution DSMs. This new cutting-edge technology offers advantages to elevation data suppliers who want to add affordable large-area DTMs to their portfolio. Going forward, updates with new data sources and new features can be realized in a timely manner. Novlum Inc. has created the first and only global bare earth elevation model, called “NakedEarth”. NakedEarth is a 30-meter posted, high-quality, consistent, instantly available, low-price Digital Terrain Model. Many Digital Terrain Models (DTMs) are available on the market that can provide 3D information of the earth’s terrain. 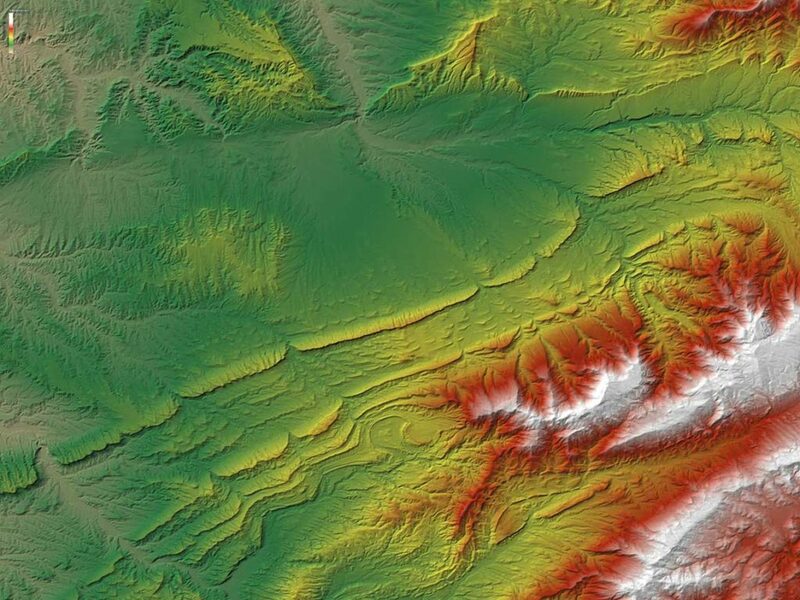 These DTMs vary in resolution, accuracy, quality and source data (optical, radar, LiDAR) and are mainly created from Digital Surface Models (DSMs) which include the height of man-made objects and vegetation on top of the underlying terrain. 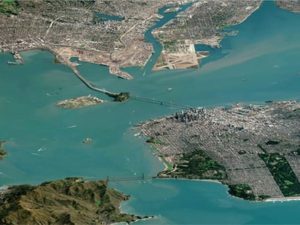 To generate a DTM, the height of all surface objects such as buildings, bridges, trees, shrubs, forests, and crops need to be digitally removed so that the elevation of the bare – or naked – Earth can be estimated. Conventional DTM generation has two severe disadvantages: high price and long delivery time. These factors are a result of manual processing by trained personnel that necessitate a “build-on-demand” fulfillment strategy. Therefore, the use of DTMs is often limited to small-area projects or projects with substantial operational budgets and long time horizons. As a result, large-area or time-critical applications primarily use DSMs, such as the DSM resulting from the Shuttle Radar Topography Mission (SRTM), even though a DTM may be better suited for the purpose. NakedEarth overcomes these conventional obstacles through automation. NakedEarth generation is fully automated and can create the complete global DTM in four days. Because of its high quality and immediate availability, NakedEarth can improve business and scientific applications for geodata users, enable proper time-critical event modeling, and support cloud-based applications. Novlum’s proprietary cutting-edge technology, with its roots in Aerospace and Defense as well as Oil and Gas applications, is a differentiator in DTM production. Novlum’s DTM generation system is efficient, scalable, and fully-automated, enabling DTM creation from DSM data without any further post-processing. It can produce high-quality and consistent DTM data over large areas at affordable prices. Artifacts found in the input DSM such as spikes and wells are removed by Novlum’s sophisticated software by identifying areas where the terrain shape deviates from its surroundings. Missing data is automatically interpolated by taking its contextual environment into consideration. Surface objects such as buildings and trees are digitally removed by smart identification and classification algorithms that take into consideration the surrounding terrain. Large forests are removed using a non-linear model that considers forest tree height gradients, especially in mountainous regions. Meanwhile, terrain breaklines are carefully derived and used in order to preserve natural features such as ridges, valleys, and mountaintops. 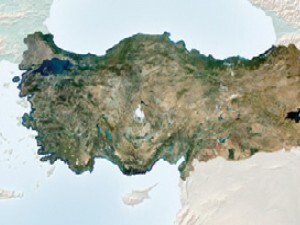 Water bodies in the input data are identified and flattened. Lakes and reservoirs are leveled to a single elevation according to surrounding shoreline heights. Rivers and canals are flattened with monotonic gradients. Oceans, including seas and inlets, are set to mean sea level. 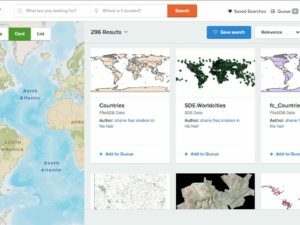 geo-datasets. NakedEarth is partitioned into 1° by 1° GeoTIFF tiles referenced to the WGS84 coordinate reference system and the EGM96 geoid. The data is accompanied by ISO 19115 compliant metadata, which provides all essential production, format, and quality information. NakedEarth is easy to download and is available directly from Novlum’s website. FIGURE 3. The example of Mount Samalas with the Segara Anak Crater Lake on Lombok Island in Indonesia demonstrates impressively the result of NakedEarth DTM processing (right) regarding flattening of water and removing dense rainforest covering the mountain slope from the input DSM (AW3D30, left). Additionally, an extensive visual analysis comparing NakedEarth to NED was carried out to assess the data’s consistency and plausibility in a variety of relief and coverage scenarios. The comparison demonstrated correct and accurate removal of settlements and forested areas while maintaining underlying terrain modulation. Visual inspections across many regions globally were performed to ensure the consistency and plausibility of the results in the absence of reference DTM data. FIGURE 4. Suburban areas in Illinois, U.S.A., shown both as AW3D30 DSM (left) and NakedEarth DTM (right). This figure portrays the successful removal of buildings and vegetation while preserving the underlying terrain in DTM. As a high-quality 30-meter posted DTM product, NakedEarth is the solution for many applications requiring bare Earth elevation information on a large or global scale and is especially attractive for low-budget projects. Terrain information is a fundamental requirement for many Earth science studies and operational geospatial applications. NakedEarth can support a wide range of applications and benefit a vast user community including government, enterprise, and academia. Its global coverage makes it a perfect candidate for cloud applications. A fundamental application with increasing significance in the geospatial industry is orthorectification of remotely sensed imagery. The number of image acquisition platforms is growing rapidly, and each new data source needs to be orthorectified before it can be used. The accuracy and reliability of the resulting imagery depend on the successful three-dimensional localization of each individual pixel. For multi-source data, a reliable terrain model like NakedEarth has to be used in the orthorectification process in order to produce high-quality deliverables. NakedEarth provides terrain elevation information that is elementary to all mapping applications. Terrain parameters like elevation, slope, and aspect are essential inputs for all topographic, geomorphologic, and geologic maps, such as contour line and slope-aspect maps. Terrain gradient information is crucial in the field of hydrological modeling to determine catchment areas, watershed, and drainages as well as direction and speed of water in runoff models. In areas where erosion is a risk, steepness is used to model and evaluate the probable risk of avalanches or landslides. FIGURE 5. This comparison illustrates the quality of NakedEarth (right) in the dense urban area of Los Angeles, California, U.S.A. after removal of urban structures from the DSM (AW3D30, left). Improvements in 3D visualization technologies are fueling the applications for virtual and augmented reality. As a foundation layer, NakedEarth is well suited for overlaying virtual building models, infrastructure, and vegetation. Combined, these 3D layers create an immersive environment representative of the real world that can be used for pilot training, mission planning, and virtual tourism. NakedEarth provides preliminary terrain information to assist flight planning, management, and landing in areas all over the world. It can be used to help identify possible helicopter landing areas for emergencies in remote areas with non-existent or limited mapping information. NakedEarth supports initial engineering planning to locate suitable project locations and to plan roads, pipelines, or railway tracks and can further assist in radio propagation modeling for telecommunications or radio tower placement. Additionally, NakedEarth is well suited to improve crisis support immediately following emergency events such as floods, storm surges, tsunamis, or wildfires by providing instant access to topographic information. In a rapidly changing world caused by natural events and large-scale human activities, high-quality, reliable geodata is a necessity for mapping, measuring, and assessing change. NakedEarth is the first and only large-area, instantly available, affordable 30-meter posted DTM on the market that is capable of supporting a vast array of geospatial applications on a global scale. 1. Global Human Settlement, European Commission, http://ghsl.jrc.ec.europa.eu/data.php. 3. 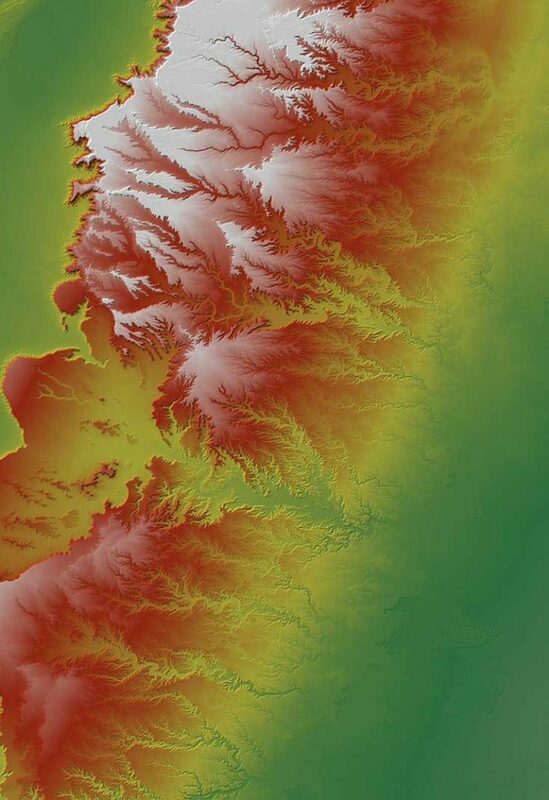 Water Body Data, Source of SRTM Water Body Dataset, U.S. Geological Survey. 4. Global Forest Map, Hansen/UMD/Google/USGS/NASA; M. C. Hansen, P. V. Potapov, R. Moore, M. Hancher, S. A. Turubanova, A. Tyukavina, D. Thau, S. V. Stehman, S. J. Goetz, T. R. Loveland, A. Kommareddy, A. Egorov, L. Chini, C. O. Justice, and J. R. G. Townshend. “High-Resolution Global Maps of 21st-Century Forest Cover Change.” Science 342 (15 November), pp. 850-53, 2013. 5. D.B. Gesch, M.J. Oimoen, and G.A. Evans; Accuracy Assessment of the U.S. Geological Survey National Elevation Dataset, and Comparison with Other Large-area Elevation Data- sets—SRTM and ASTER; U.S. Geological Survey Open-File Report 2014–1008, 10 p., https://dx.doi.org/10.3133/ofr20141008, 2014. 6. J. Takaku, T. Tadono, K. Tsutsui, M. Ichikawa; Validation of ‘AW3D’ Global DSM Generated from ALOS PRISM, ISPRS Annals of the Photogrammetry, Remote Sensing and Spatial Information Sciences, Vol. III-4, pp.25-31, 2016.